Jacob Marais, grandson of Charles Marais, built the manor house in 1764, where it remains today as one of the earliest and finest examples of Cape Dutch architecture. With its ornate gables and thatched roof the Manor House is a fine example of splendour and history. The interior features an elegant and eclectic rendition of old and new with a selection of furniture in the Cape, Art Nouveau, Art Deco, ball-and-claw and retro style. The end result is a conscious move away from grandeur towards unaffected sincerity with classical refinement. The farm prospered and in 1705, Claude Marais (who took over the management of the farm after his father’s passing) declared 8000 vines and 6 leaguers of wine. Charles Marais, a Huguenot peasant from Le Plessis Marly in the Ile de France region wanted a better life for his family. They were plagued by drought, famine, crippling taxes and ensuing poverty. These factors coupled with religious persecution saw them setting sail for the Cape in 1687 where they settled in the Groot Drakenstein Valley. In 1693, Cape Governor Simon van der Stel granted land to the Marais family. They named it after their hometown, Le Plessis Marly. Later in the hands of his grandson, Jacob, the estate grew to one of the finest in the region. It was Jacob who built the manor house in 1764 that remains one of the earliest and finest examples of Cape Dutch architecture today. The Grant was officially signed on 1 December 1693. Sadly, Charles Marais passed away after only six months on the farm with a trivial dispute, allegedly over an unripe watermelon, leading to his untimely death. The story goes that a Khoikhoi named Dikkop (or Edissa) flung a stone at Charles, causing fatal haemorrhaging. Charles Marais was well equipped for a life as a pioneer in agriculture as the region he came from in France used to supply the Parisian markets with wine and cereals. By 1729, the year both Claude’s mother Catherine Taboureux and his wife Susanne Gardiol passed away, an inventory of the estate declared 20 leaguers of wine worth 25 rix-dollars each, 10 empty leaguers of wine, one funnel, and two old presses—all proof that the Marais family had transcended their peasant roots to become worthy landholders. 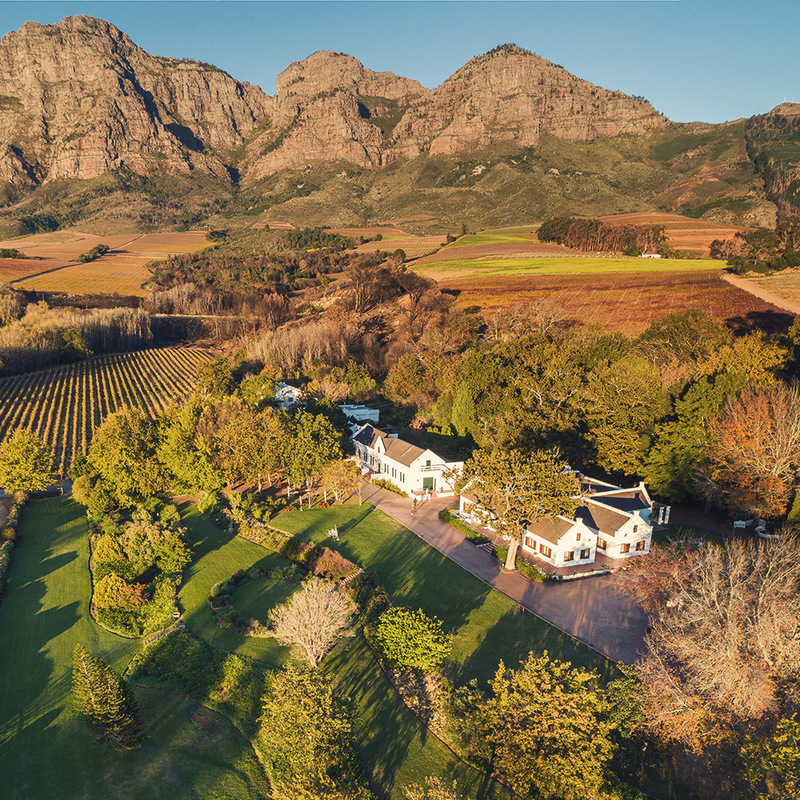 The farm truly began to prosper in the mid 18th century under the stewardship of Jacob Marais (and his wife, Maria Boeiens), the grandson of Charles Marais. In 1764, the same year the Manor House was erected, the vineyards boasted 35 000 vines, and the cellar contained 28 leaguers of wine. Pressing buckets, funnels, wine presses and ‘stukvate’ filled the cellar. There was also a separate distilling room with two brandy stills and two leaguers of brandy. Pieter Marais took over the reins from his father Jacob, and under his guidance the farm also flourished, with the vineyards expanding to 55 000 vines. Daniel Hugo was the farm’s next proprietor after having married Pieter’s third-born, Rachel. Between 1805 and 1831, the farm thrived under his care. There we now 60 000 vines, which produced some 43 leaguers of wine. During this period Daniel owned two cellars. The second was on a piece of land on the adjacent Rust-en-Vrede. The historic landmarks of Plaisir de Merle act as markers through time and as a tribute to the generations that came before. A walk around the estate reveals this long history in forms of gables, symbols and more. Jacob Marais (grandson of Charles Marais) built the manor house in 1764, where it remains today as one of the earliest and finest examples of Cape Dutch architecture. In the same year that the manor house was erected, Jacob’s cellar contained 28 leaguers of wine (roughly 1000 vines were required to make 1 leaguer of wine). Various consolidations transformed the property into the modern Plaisir de Merle, which passed by marriage to the Hugo family in the 19th Century. This was when the 1831 cellar was built, and the farm started producing 43 leaguers of wine. 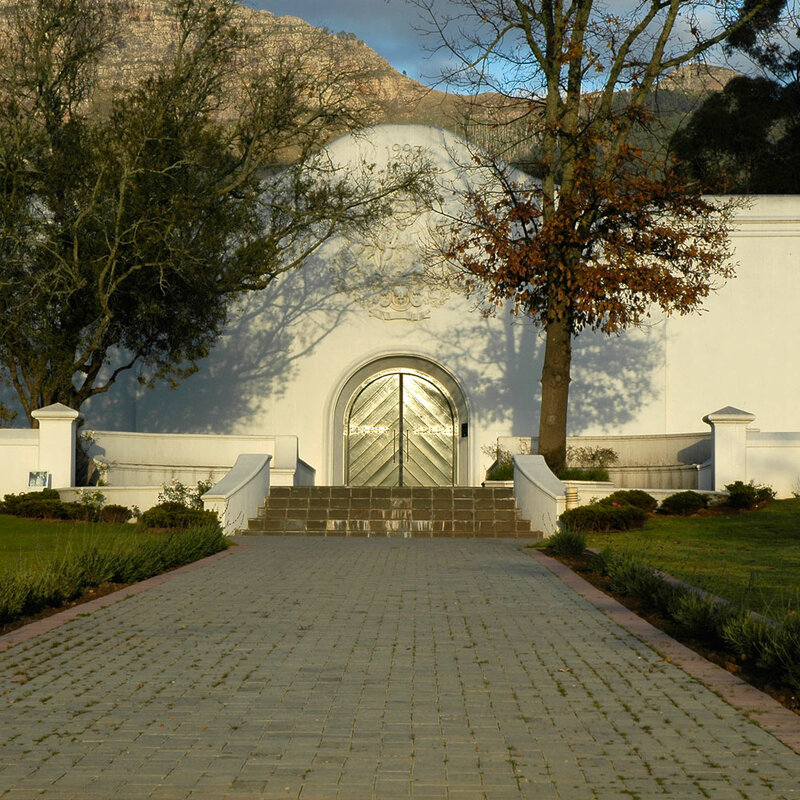 After several short tenures it came under the ownership of Stellenbosch Farmers’ Winery (now Distell) in 1964. Three decades later, a new cellar was commissioned with the brief to the architects to take their lead from the farm’s heritage and natural surroundings. Incorporating wood, water and stainless steel as key elements, the modern building was completed in 1993, surrounding it is a moat that both cools and insulates the building within. The manor house has also been restored and serves as a guesthouse and function venue for small events. The interior features an elegant and eclectic rendition of old and new—a design aesthetic that pays homage to the estate’s long legacy and its forward thinking, progressive ethos. The lynhuise or longhouses were erected by Frans de Wet (owner of Rust en Vrede) in 1821 though the gable bears the date 1831. Another historic landmark on the property is the watermill, a replica of the one Jacob Marais built for his wife Maria in 1730. The estate is rife with symbolic elements that tell the story of craft, hardship, family and endurance. At the cellar’s entrance the frieze (or blazon) created by artist Jan Corewijn in 1993, pays tribute to early pioneers by visually portraying their life and passion. The griffin or gryphon forms an important part of Plaisir de Merle’s logo, and also appears in the form of stylised gargoyle-like waterspouts on the corners of the cellars. Half lion and half eagle, the majestic Gryphon is the king of both beasts and birds with the vision of the eagle and the strength and courage of the lion. Recognised for its power and intelligence, the Gryphon is said to be the guardian of treasures. 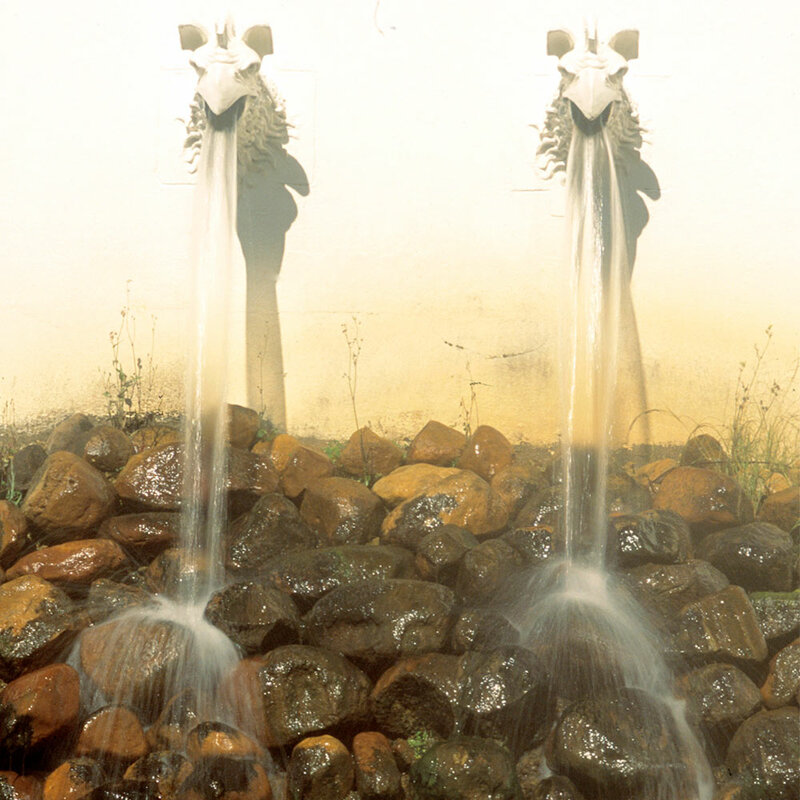 Explore these and many more symbolic features whilst you visit the estate for a cellar tour.